Apple has asked that package delivery service UPS hold back stateside shipments of its new iPhone 3G S handset that may have otherwise arrived early, just as the company prepares for an early afternoon launch of iPhone Software 3.0. 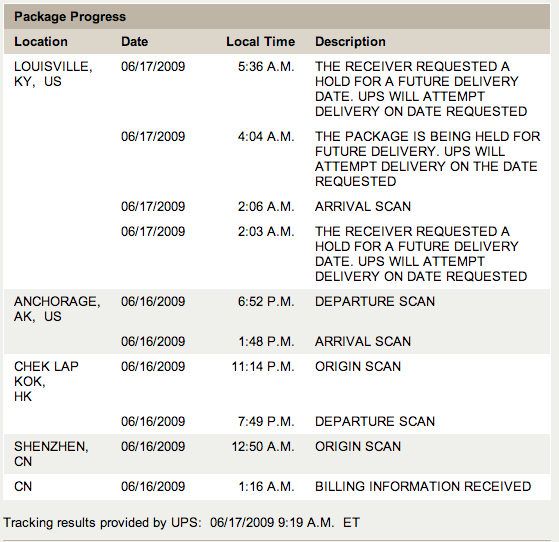 Some of the first U.S. customers to place their pre-orders for the new iPhone 3G S began receiving shipment notifications from UPS earlier this week with delivery dates of June 17th (today), a full two days before the device is slated to hit retail stores. Though UPS strives to deliver packages as quickly as possible once they arrive at local sorting facilities, Apple overnight asked the company to hold back home delivery of the new handsets until Friday the 19th, the day the device is slated to launch nationally at Apple, AT&T, Best Buy and Wal-Mart retail outlets. As such, many customers awoke this morning to find that UPS had updated the delivery status of the iPhones with an exception stating that, "the receiver requested a hold for a future delivery date" or "the package is being held for a future delivery date." This isn't the first time this particular situation has come up. Apple has several times in the past shipped products such as iLife and iWork ahead of their launch date. In some of those cases, customers actually received their orders early but were later asked to surrender them back to the shipping company for re-delivery a few days later at Apple's request. Meanwhile, existing iPhone and iPod touch owners are anxiously awaiting the arrival of iPhone Software 3.0, slated for today. Although some had expected Apple to make the software available sometime in the early morning hours in order to cater to those customers in international time zones, a release early this afternoon now appears more likely. A few hours ago, Apple Singapore began sending text messages to customers informing them the release would show up in iTunes sometime after midnight local time. Assuming U.S. customers will gain access to the software at the same time, it would suggest a stateside release between the hours of between 1:00 pm and 2:30 pm Eastern time or 10:00 am and 12:30 pm Pacific. For those in the UK, the software should turn up between the hours of 5:00 pm and 7:30 pm.